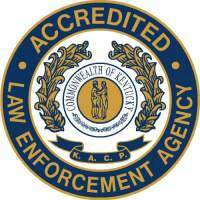 The Paducah Police Department received its initial accreditation through the Kentucky Association of Chiefs of Police (KACP) in 2004. The department further achieved the accreditation seal in 2009 and in 2014 for another five year term. The Paducah Police Department is one of approximately 77 KACP accredited police and sheriff's organizations statewide. According to the KACP, the accreditation process "reflects that the agency was carefully measured against an established set of standards and has met or exceeded professionally accepted practices in law enforcement." The accreditation process is lengthy and requires an independent evaluation of dozens of organizational, procedural, and operational standards. Each year the department is required to take steps to maintain accreditation standards including reviewing or revising policies and procedures. Achieving accreditation benefits the City of Paducah and the Paducah Police Department since it establishes a high standard by which to judge and enhance performance. The accreditation seal helps to provide a stronger defense against lawsuits and corresponds with an increase in community confidence in the department. It also means that Paducah receives an annual discount from our insurance provider, the Kentucky League of Cities. That discount saves the City approximately $7500 per year.